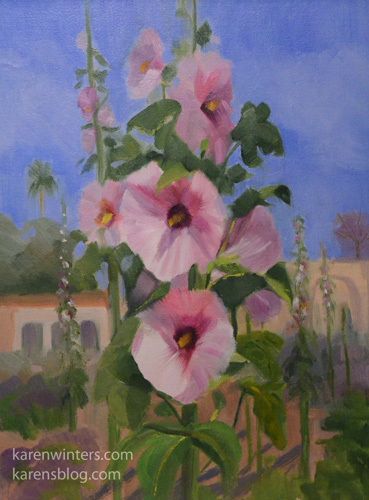 One of the lovely features of Mission San Juan Capistrano, in southern California, is the mission garden which is filled with seasonal flowers such as these hollyhocks. It’s been said that the padres called this biennial plant St. Joseph’s Staff, because of its great height. I have some growing in my own garden and they are close to seven feet tall. What I like about painting hollyhocks is that the petals are so translucent in the sunlight. Capturing the delicacy is challenging, but fun. Palm trees and blooming jacarandas can be seen in the background along with the mission architecture. This painting is available now. Click this link to write for price information. This is one of the first blooms from my garden this year, which was specifically planted to provide floral material for still lifes. It was painted from life. I was attracted to this rose because of the numerous blooms that it produces on one stem (typical of a floribunda) as well as the rich color. As the rose blooms, the dark yellow gold fades to delicate lighter shades. 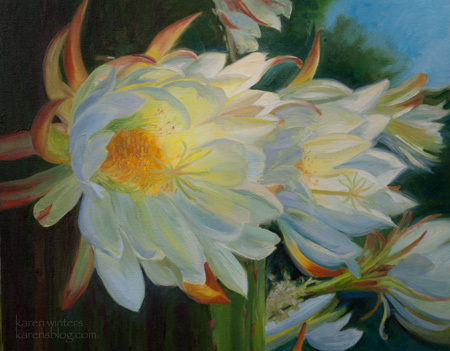 To see more of my garden in progress, visit http://www.facebook.com/ArtistInTheGarden. 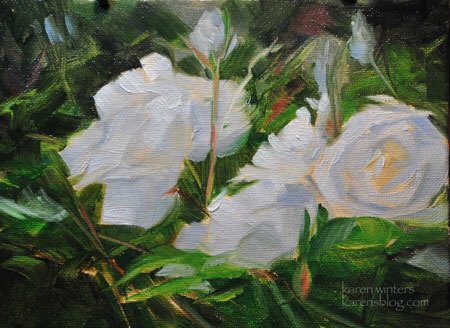 Iceberg roses are among the most popular white rose varieties in California (perhaps in other US states, too.) These perennial plants have a carefree look about them, somewhat different from the formality of other hybrid tea roses. I decided to paint this group in a casual impressionist style, loosely, as though they were being tousled by the wind. This wonderful cactus plant was at least ten feet tall, and covered in flowers so large and radiant that it took my breath away. The blossoms were as wide across as my hand, easily. Those tireless workers, bees, were swarming all over them, harvesting pollen. However I chose not to paint those busy folk on this occasion. I love bees but not everyone feels the same way and I wouldn’t want their presence to prevent the painting from finding a new home. Maybe if I paint the subject again – I took many photos of this proud beauty. White flowers are never truly white because they pick up color from everything around them – the blue violet sky light in shadow, the warm light of the sun, and so on. The value range of white varies greatly, too. Painting this was like trying to solve a large jigsaw puzzle. A bit frustrating at times, but a lot of fun. 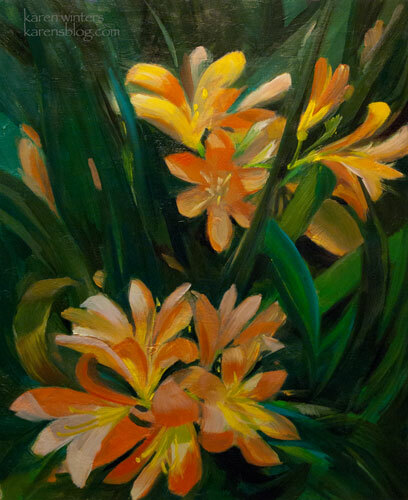 Clivias, also known as bush lily, glow with bright orange colors through thickets of dark green strapping foliage. These secondary colors (orange and purple) make a nice contrast to each other. Painting this was like working a jigsaw puzzle. Every flower has dimension. The petals turn with the light, and the strappy foliage intersects the blooms in interesting patterns. I don’t do a great number of botanical studies – especially not realistic ones – but I’m thinking of doing more this year as I redevelop my garden which will provide material for compositions. 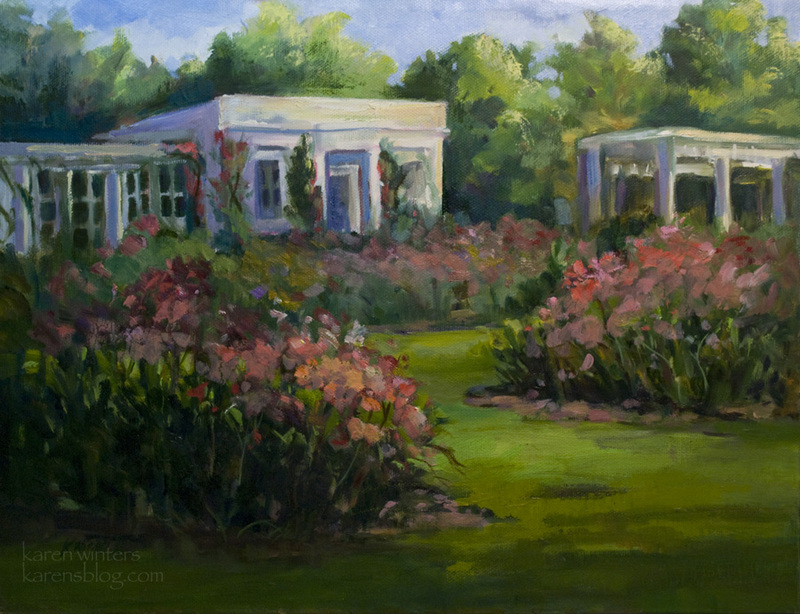 In the meantime there is always Descanso gardens, walking distance from my house, where I’ll have a solo show in the Heritage Gallery in the Boddy House mansion this November and December. This painting has a history. 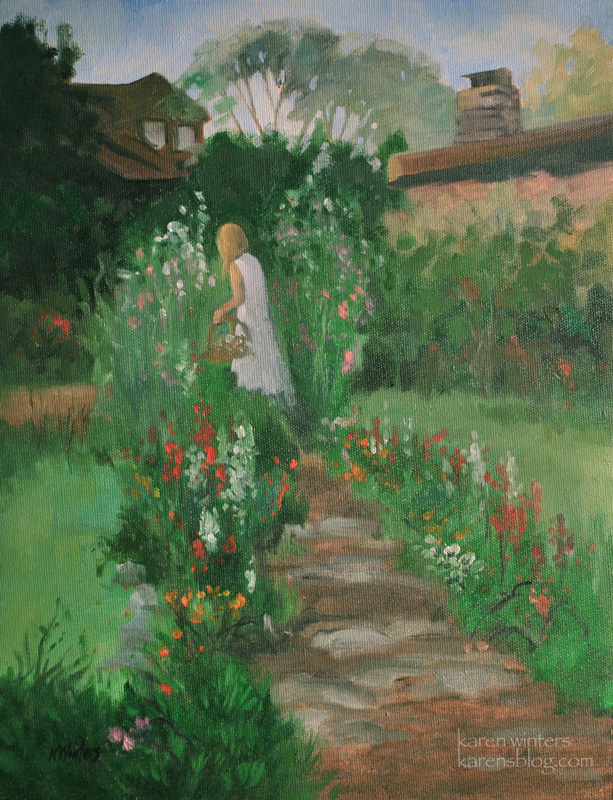 Several years ago, I painted a smaller version of it, and it was exhibited for sale at a local store in La Canada. One day in April a few years ago, a car transport trailer lost its brakes on the Angeles Crest Highway and crashed through the store. Two people lost their lives in the accident, and one of the most minor casualties was that watercolor painting, of which I still have a remnant. A very lovely woman contacted me a few months ago and asked if the original painting was for sale (it was not) but I offered to paint it again for her in a size to suit her home, and this is the result. She and her husband were married at Descanso Gardens many years ago, and the painting will be a memory of that very special day. And it makes me especially happy to know that the destroyed painting survives in a unique way. It became a study for this one, which will be in their family for years to come. 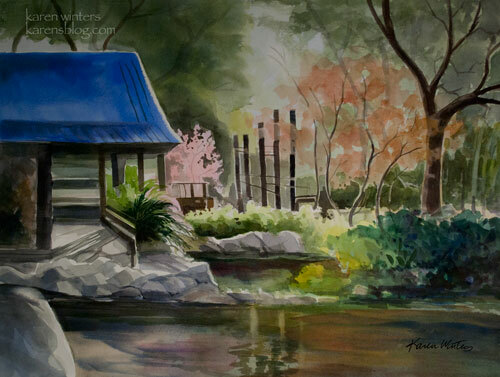 Because of my concentration on oil painting, I haven’t been painting watercolor as frequently. But I enjoyed this return to the medium so much that I will probably try to devote a little more time to it in the coming year. Merry Christmas to all those who are celebrating it tonight and tomorrow. This is a plein air painting that I did a few years ago, and somehow it escaped being photographed and posted to my blog. A recent conversation prompted me to revisit it and I discovered that it was missing from my site. Not too long ago we renewed our Huntington membership and I’m looking forward to visiting again when the camellias are in bloom. On a trip a few weeks ago, they had a California landscape exhibit which I enjoyed, along with other permanent collection work in the Paul and Heather Sturt Haaga gallery. If you live in Southern California and you’re not a member of the Huntington, what are you waiting for? 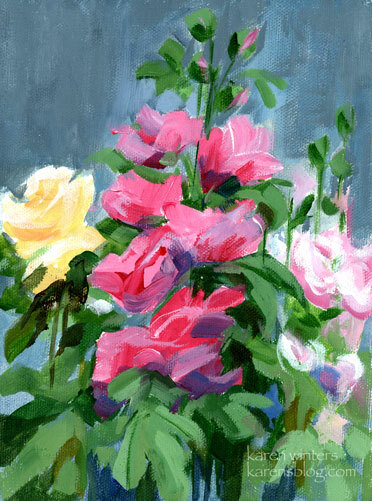 A miniature painting, 6 x 8″ – of some hollyhocks which are currently blooming near where I live. Ruffles and flourishes in a summer mood. I’ve been experimenting with acrylic and doing some plein air painting with it, too. Although it handles much differently from oil, there are similarities with both oil and watercolor, two media that I feel comfortable with. I especially like the brilliant color which doesn’t seem to muddy as much as oil does. If you have a question or or would like to find out if this painting is still available for sale….. 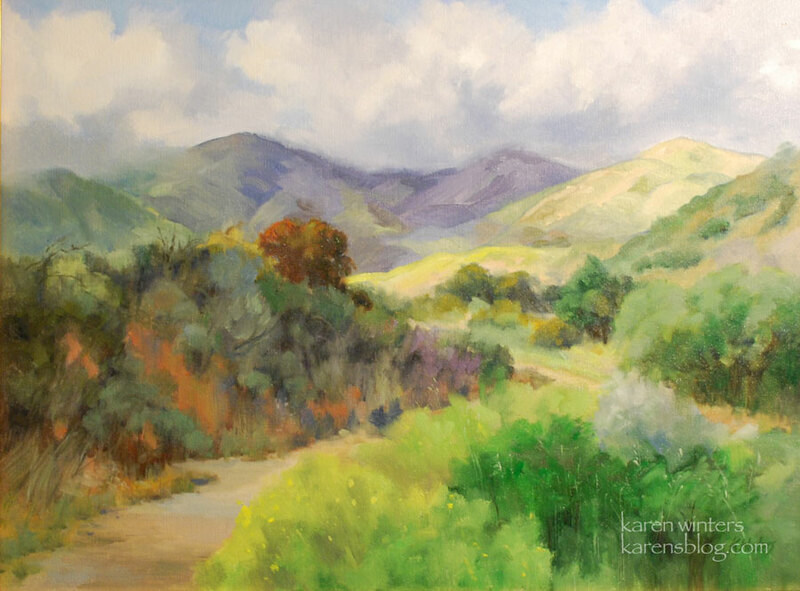 This painting is brand new and features a viewpoint from a trail in the Claremont Wilderness Park. Depending upon which way you’re hiking on the trail, it’s either the beginning or end of a loop that goes way up into the mountains. On the day I was there and did a small on-location study, there were spectacular clouds in the sky, making interesting shadows and bright spots on the ground – a painter’s delight. I’m taking the painting tomorrow to the Rancho Santa Ana Botanic Gardens show in Claremont for their annual juried Art in the Garden show. This will be my third year participating in this wonderful location. I would love to see you there, so if you plan to attend, please email me and I will send you a flyer you can print out – good for free admission this weekend only. 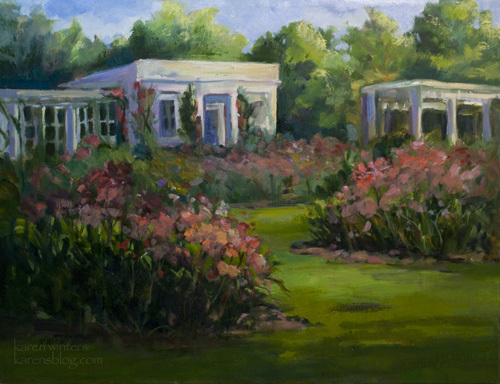 Please make a calendar date: Next weekend, June 12-13, I will be painting in my home territory, Descanso Gardens in La Canada Flintridge during a 2-day Art in the Garden event. Look for a number of painters painting around the pavilion in the International Rosarium. I will be bringing a selection of works for sale also. More later … now I’m back to getting my last-minute framing done.